Broaching is a machining process with a special designed multi point cutting tool called broach. This process is widely used in automobile industries for machining various holes, key ways, gears etc. Broaching operation involves linear motion of tool about the work piece. This movement of tool removes material from work piece and provides a desired shape. Broaching tools involve a large number of progressive teeth which make this operation different from other process. Each tooth takes off a successive layer of the material which removes large material in a single pass. One of the major advantages of using this operation in various industries is its ability to give better surface finish and good accuracy with mass production rate. In this article we will discuss about broaching operation Principle, tools, types, advantages and disadvantages. As we discussed the metal removal process in broaching operation is similar to shaping process except it uses a series of progressive teeth which can cut more material in a single pass. Shaping process requires number of strokes to cut required width of work piece in which each stroke removes a thin layer of metal. This process needs more time which is not beneficial. This limitation is taken off by broaching process by providing a successive series of cutting edges on a rod or bar type cutter. Broaching uses a multi point cutting tool having a series of progressive cutting teeth. This tool should have high strength, hardness, cutting speed and wear resistance properties. It is made by high strength tooling material like high speed steel, cemented carbide etc. This tool is mounted on broaching machine. Broaching machine is simple in construction. It is used to provide linear motion of the tool and hold the work piece at stationary position. The tool movement can be either vertically or horizontally. According to it, these machines can be classified into two type vertical machine and horizontal machine. Horizontal machine is mostly used for internal machining and vertical machines are used for external and surface machining. Internal broaching is mainly used to enlarge holes. This process generally uses pull type broach but for lighter work piece, it sometime uses push type broach. External broaching is mainly used to flattening of a surface, machining key ways, slots, grooves on outer part of an object such as shaft etc. This process is also used for gear manufacturing process. 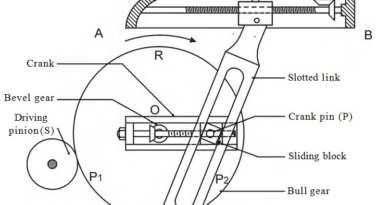 A broach which is subjected to tensile force during machining, called pull broach and the type of broaching operation by pull broach is known as pull broaching. This operation prevents misalignment and buckling. The pull broach is usually made in single piece and used for internal broaching. Push type broach is usually subjected to compression force during machining. These are made shorter compare to pull type broach and mostly used for external broaching. Ordinary cut broaching uses ordinary broach in which teeth increases in height gradually from tooth to tooth along length of broach. In progressive cut broaching teeth increase in width instead of height along length of the broach. Solid broaches are made in single piece which are mostly used for internal broaching. Sectional broaches are made in section by assembling various section of broach. Module broaches are made by various modules assembled in a single unit. It is used for external broaching. High production rate because whole amount of metal is removed in single stroke. High surface finish and better accuracy. Broaching can be used for both internal and external machining. 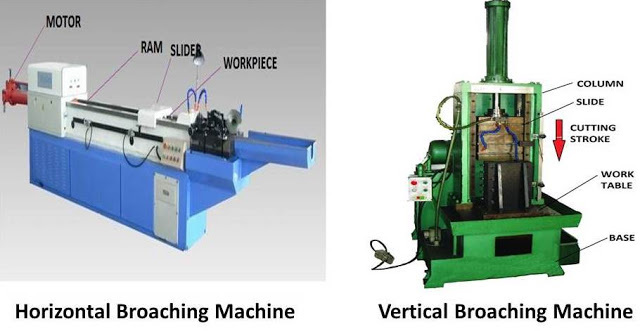 Broaching machines are simple in design and construction. It can be used for mass production. This process needs a special design tool for each process. This is not suitable for small batch production. It is only suitable for machining holes and flat surfaces. This is all about broaching operation, tools, types, advantages and disadvantages. If you have any query regarding this article, ask by commenting. If you like this article, don’t forget to share it. Subscribe our website for more informative articles. Thanks for reading it.